Few athletes in any sport have as much heart as Grant Hill. He has won the NBA’s sportsmanship award three times. Not only does he score a lot of points, but he is also a great defender. Grant won the college national championship twice with Duke University. He went on to win the NBA Rookie of the Year award and be one of the best players in the league. But soon, he got injured and struggled to get healthy for several years. After a lot of hard work, Grant is once again a very effective player. These are all examples of why Grant has heart, but they don’t explain exactly what “heart” means. We asked Grant to teach the meaning of this term at a recent practice. Jason: Welcome to English, baby! I am Jason here with Grant Hill. We were hoping you could help us learn the term “heart.” As a slang term, what does it mean? Grant: Yeah. I think when you say someone has heart, it means they have determination. They have resolve. They have fight. They’re going to play with a lot of emotion and a lot of energy. You know, those are the type of players, the type of competitors, that you want on your side, guys that have heart. To me, that’s what playing with heart means. Jason: You’ve conquered a lot of injuries in your career. Did that take heart? Grant: I think so. I think so. It takes the old expression, when you get knocked down, you’re gonna get right back up, and to me, that sort of exemplifies what having heart is all about. You know, it’s not always going to be pretty. It’s not always going to be successful. But you’re gonna have a certain spirit about you, a certain fight about you that even in the midst of adversity and obstacles, you’re gonna still fight through them. When you have that, when you have that kind of resolve, then you have heart. Jason: You’re also a great defender. Is heart a part of playing defense too? Grant: Yeah. Heart, it’s pride. It’s discipline. It’s taking it personal. On defense, you have to have heart. Rebounding, you have to have heart. There are so many different positions and different facets of the game that require heart, and there are guys in this league who have had long careers, who are considered average players but have figured out a specialty and done it well, and in order to do that, you have to have tremendous heart. Grant: Alright, English, baby! Sounds good. Grant tells Jason what it means to have heart. Someone with heart has determination and spirit. They don’t get upset or discouraged when something is difficult or challenging. They keep fighting and never give up. Grant is a player with a lot of heart. He has had many injuries during his career, but he never gave up. He worked hard to recover from his injuries and kept playing. He’s had a very long career in the NBA. When you have heart, you can succeed even when something doesn’t come easily for you. Grant says that some players who don’t have as much natural talent still succeed in the NBA because they have heart. Who do you know who has a lot of heart? Have you ever overcome a difficult obstacle in your life by having heart? For more English lessons with Grant and his teammates, visit our blog. It’s quite hard lesson for me and I learned many new words. I agree with Grant, because to conquer the difficult situations you should have ’’heart’’ and be determined and strong in spirit person.When you met face to face obstacle you shouldn’t get upset and struggle to the bitter end. Think so much>May Gad bless you. if u have heart , and never give up , u will succeed . I have a heart for English. I love it and I am ready to learn in all day long. Thanx, Englishbaby! (thumbs up if you agree). Actually everything in our lives depend on the desire . if you have an strong determination someday you will be able to passing difficult things . I had some problems one year ago , I felt in myself some fears but with time I decided to challenge all my problems . There are many things have been gone , don’t look behind your back . you don’t feel comfortable if you still remember your last life . We should try to do best in our selves, I have many things in my life deserve living . I don’t want to be pessimistic , I prefer to be all the time ready to the next . He is one of the many people over the world deserve talk about his self , He is a good example , I have one of them , His name Is roger federe . For me I should fighting this life until someday I will be winner . From Palestine Hello to All members on Englishbaby . I think that how much we achieve in life depends on how much heart we have. We all encounter difficulties in our lives; having heart, believe that we can succeed whatever happens, never give up: this is what help us overcome the obstacles and become stronger and wiser. 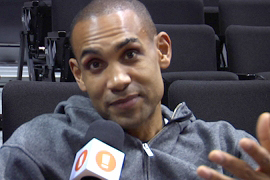 I really admire people like Grant Hill, and I like reading about them. Their stories ispire and motivate me. I consider myself an optimistic and positive person. I always look for the positive sides in whatever happens to me because I’m sure there are some even if I can’t see them at first and this generally helps me rebound quickly after a difficult period. but when sometimes my spirits are low or when I feel overwhelmed by negative feelings and thoughts that prevent me from going ahead, reading about people who have overcome difficulties, most of the time, bigger than mine just recharges me and I say to myself they did why not me. we should always remind ourselves that success depens on us and it still possible unless we decide it’s not and give up trying. I think there are many things which is common in any culture and language, one of them is ” Heart ” That is a word full of positive meaning in many conditions, situations and fields, one of those fields is in sports when someone is playing with his/her ” heart ” for their team, club or country, most of the time this will happen when they are playing for their country (nations), and there will be no reason more powerful but “heart”. it is great lesson although it has some hard words to me because iam not that perfect in english so i will keep hard working . “Take heart” word can be viewed throughout the literature in the deeds of Beowulf, Odysseus, Illya of Murom :))) The bold actions, reckless determination, resourcefulness deserve a lot respect and it rubs off on us more or less. We’re mesmerized by the hero’s deeds and want to be like them. I remember being a kid, after watching the movie “Fanfan la Tulipe”, (1952), was so inspired by the main character that we all ended up running in our playground imitating the swashbuckling hero. After 25 years old, the tune is still in my head helping to add a perennial freshness to a long time ago hero. All these heroes from the literature are not doubt, magnanimous to the reader and kind of a role model. But we live not in the movies, so just got to take heart in something else. For me it’s just to be consistent and persistent in any kind of venture you take. “To take heart “ is also a synonym of a strong willpower that can be expressed in different situations whether you go along the street and see a beautiful dress, but you don’t buy it. It takes heart, you know. Or you smell beautiful aroma of McDonald’s and you’re not allowed to eat that junk food and it takes heart to resist that temptation. What I think that our today’s life is so full of temptations and stressful situations that it really takes heart to sort it out and get on the right track with a good plan and every day follow it. That what takes heart in my understanding. It takes heart also not to answer to bullies and not to pay attention on their caustic remarks and just wishing them all the best and keep going on, chin up,feeling happy. Oh, yeah, it takes heart. Wow, yet again we’ve messed up today’s lesson . I love my work :) Thank you, Anja. WOW, the beauty and the beast!